The county is named after the tribe of "shoal people" who lived along the shallow portion of the Yakima River near present-day Ellensburg. The permanent settlement of the Kittitas Valley began in 1867. During 1870, the first mercantile store, known as Robber's Roost, was started by Andrew Jackson Splawn and Ben Burch. In 1872 John Shoudy purchased this store and 160 acres. He platted a townsite, naming it for his wife Ellen, and recorded his plat on July 20, 1875. The first preaching was here. The photographer was almost too late! In the early part of 1877, Keithly Bailes (overland in 1861) settled northeast of Ellensburg in the Fairview district. He was a farmer and a carpenter as well as a preacher. Mr. Bailes, the first Christian Church minister in Kittitas County, preached in homes and the log schoolhouse picture here. There is a profile of Keithly Bailes. Charter members here included: Barnhart family, Irene Cumberland, A. J. Hodge family, Mrs. C. T. Maynard, and the Rader family. This marked the beginning of the Disciples in and around the Ellensburg community. 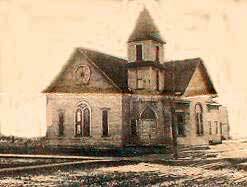 In 1886 the church was organized in Ellensburg by red-haired "Stormy John" McCorkle, an evangelist from Santa Rosa, California, assisted by Jacob T. Eshelman. One listener of McCorkle's said that his sermons were audible outside of the building walls and down the street. Mrs. A. M. Church, Mrs. N. Davidson, A.C. Dawes, Mrs. E. Grissom, J. M. Grisson, Mrs. P. C. Grissom, Mrs. M. Gibbs, Mrs. F. F. Packwood, Mrs. C. E. Pool, Ellen Rader, W, A. Rader, Mrs. A. Stone, Mrs. M. E. Stone, N. Stone, Mrs. Mary M. Tripe, W. M. Trisson, Ella Tucker, and J. R. Tucker. Building at E. 4th and N. Sampson. can be seen to the right of the building. Washington was still a Territory and became a state three years later, so it is reasonable to believe that many of these were overland pioneers. The church grew quickly and purchased property. Their building was constructed in 1887. The lumber was made from logs brought from the mountains on bobsleds to the Ellensburg mill by men of the church. The building and the parsonage were constructed by volunteer labor. Neal Cheetham held a meeting in the new building located on the northeast corner of East Fourth and North Sampson streets. The converts were baptized in Wilson Creek, in front of the building. Among the early members and financiers of the building were Frank and Arabella Fulton. Mrs. Fulton notes this in her autobiography Tales of the Trail. They arrived here in a wagon train from Texas in 1883. They, and others with them, had been members of the Christian Church on Bear Creek, Wise County, Texas. The building as pictured was built in two phases because a Northwest Tribune article dated May 23, 1890 reported a 14 x 22 addition, costing $1,200 was being added to the (Christian) Church at Ellensburg. When completed the church would be 30 x 60 feet and the steeple, which was being added, would be 60 feet high. In addition to John Provines McCorkle, leaders included Eugene C. Sanderson and J. E. Denton, evangelist from Iowa. There is a profile of E. C. Sanderson. We have 100 members in and about Ellensburg, and a good house there. This was before he settled at Ellensburg himself. It should be noted that 1889 was a year of severe drought and that some contracts for preachers that year were only for three months instead of the more common one year. The Thorp families that came from Polk County, Oregon, had a heritage in the Stone/Campbell Movement, but they were not among the charter members of the Thorp Church of Christ when it formed in 1895. Some of the group had been meeting since 1890. Charter members of 1895 were Myra Barnett, Robert Barnett, Retta Barnett, Eldora Briggs, William Briggs, Lena Burns, Frances Childs, Mary Childs, Hannah Childs, Warren Childs, George DeShazer, Nancy DeShazer, Allie Ellison, Eugene Ellison, Maud Ellison, Ruth Ellison, John Ellison, Lewis Ellison, Deborah George, Ellis George, Dee Goodwin, Lillian Goodwin, Olive Goodwin, Martha Mattox, William Mattox, Jennie Osborn, Florence Snyder, Dora Stultz, Philip Stultz and Laura Turner. The primary movers is launching the new congregation were Mary Childs and Sarah Goodwin. Their work was successful, but Sarah Goodwin is not on the charter roll of 1895 because she had already passed to her eternal reward. Services were held in a school house, then the building was constructed during 1896-1897. The portion on the left in the photo was probably added after the original construction. On an educational note, Teddy Leavitt formed a Bible College here in 1949. 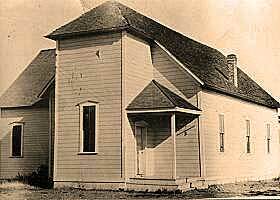 When their building burned in 1950, Mr. Leavitt moved the college to Selah, Washington where it continued until 1977. In 1980 or 1981 the church became Thorp Community Church. A homecoming photo of the church is on this photo link.